Deep in the forest lives a spooky sorceress known only to the nearby townsfolk as the “Red Bean Witch”. Feared by many, she is believed to be summoning great dark magic when the occasional boom rattles the windows and eardrums of anyone nearby. In an attempt to spare themselves, the villagers venture into the woods to scatter bones as an offering. What the town doesn’t know is that these terrible explosions are necessary to realising the Red Bean Witch’s true desire: to construct the most elaborate magical puzzles this world has ever known! Also, her loyal dog, Choco, sometimes runs out of bones. 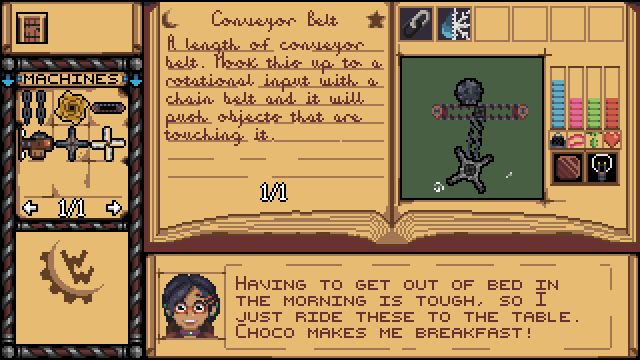 Witchy Workshop is a physics-based puzzle game where you help solve the Red Bean Witch’s puzzles as her dog, Choco. This Windows release features a limited number of parts and premade puzzles, similar to a demo. Subsequent releases are slated to include sandbox puzzle building and sharing, improved elemental simulation, more types of magic, animals, additional magical and non-magical parts, and the “Ultimate Woof Power”, Choco’s secret weapon. A variety of parts magical, alchemical, and mechanical! Conveyor belts and crossbows mingle with gemstones and crystal balls. Setting off fireworks with a candle might normally be a bad idea, but in the Workshop's noble pursuit of puzzle-solving, there's no such thing as a bad idea! 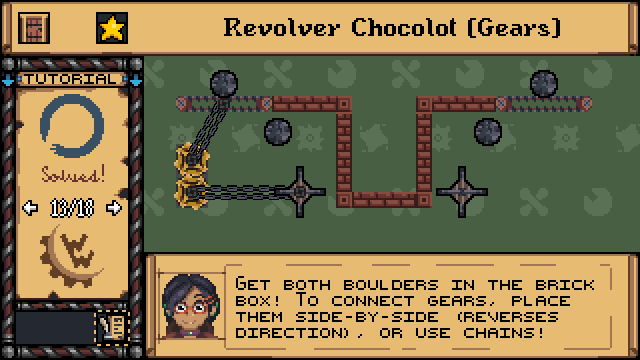 Tutorial puzzles help you learn about the magic and machines of the Workshop - then test your skills in 30+ puzzles over three levels of difficulty!! 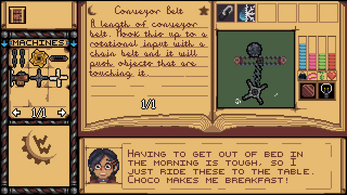 The Codex has a descriptive page for every part in the game, alongside the Red Bean Witch's comments. Don't know what mandrake juice could possibly be useful for? Me either, but she knows! Witchy Workshop supports resolutions all the way down to 640x480, runs well on old machines, and has performance and accessibility options, such as disabling animated elements and toggling piece outlines. An accessibility report is available on our website (also linked below, under "More Information"). Most games don't do this! This release of Witchy Workshop is free, but donations received will go toward recouping two years of late-night-programming snack runs, website and development costs (including the development of future updates and games), some recent vet bills, and maybe a bottle of wine. Please note that you can press F12 or PrtScr to take a screenshot. It will be saved in the Local directory described below. If you’re reporting a bug, *please* attach debuglog.txt, log.txt, and wwsettings.ini. We may not be able to track the issue down otherwise! You can find these files in C:\Users\YOUR USERNAME HERE\AppData\Local\WitchyWorkshop. As a shortcut to get there, you can press Windows Key + R, type %localappdata%\WitchyWorkshop (or put it into Windows Explorer's navigation bar), and press Enter. Witchy Workshop 1.0 has been released!